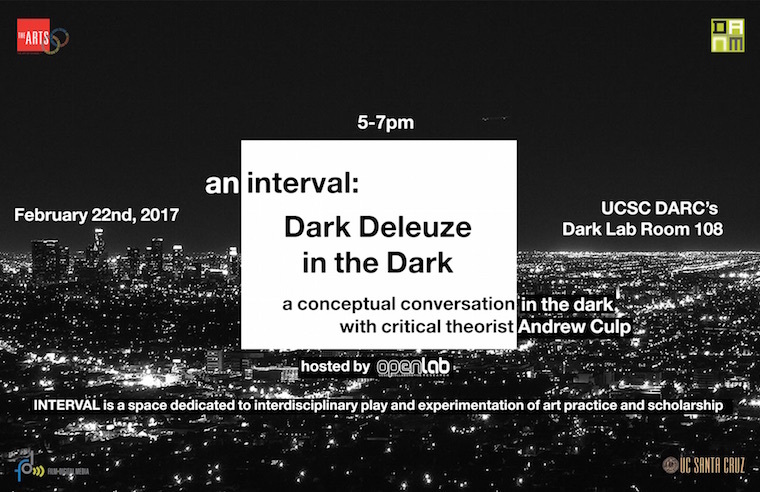 “Dark Deleuze in the Dark" is a conceptual conversation conducted in the dark with Professor Culp that addresses themes from his work on interruption, un-becoming, and escape. In our age of ubiquitous connectivity, joy, and self-disclosure, how might darkness help us to cast a line to the outside? As Culp argued in a recent interview, "A revolution that emerges from the darkness holds the apocalyptic potential of ending the world as we know it." This event is organized by INTERVAL and hosted by OpenLab with support from Film & Digital Media, Digital Arts & New Media, and the Arts Division at UCSC. INTERVAL is a space dedicated to interdisciplinary play and experimentation of art practice and scholarship. Andrew Culp is a Visiting Assistant Professor of Emerging Media and Communication at the University of Texas, Dallas.